This article first appeared in The Edge Malaysia Weekly, on March 12, 2018 - March 18, 2018. THE new year was off to a good start with CEOs giving the Malaysian economy the thumbs up as confidence, measured by the Vistage-MIER CEO Confidence Index, breached the 100-point threshold level of optimism for the first time since 3Q2013. At 105.8 in 1Q2018, the index is also the highest since 2Q2011. Not only are CEOs upbeat about the current state of economic affairs, they are equally euphoric about the prospects of the economy and their firms going forward. After staying in the red for more than six years since 2Q2011, the current economic conditions index finally turned the corner with 101 points, indicating CEOs’ satisfaction with the domestic economy. Almost a quarter of them believed that economic conditions have improved, with more (35%) expressing hopes of further improvement in the coming months. Reflecting this is the index for expected economic conditions which, at 118, also surpassed the optimism threshold this time around, after remaining below it for seventeen consecutive quarters. The CEOs are also projecting the short-term outlook for their firms favourably. The index for expected revenue rose to 157 in 1Q2018, its highest since 2Q2013, with 66% of the CEOs forecasting higher revenues soon. Better profits are also expected, as shown in the latest expected profitability index, which soared to 144, its highest since 2Q2011. Fifty-five per cent of the CEOs are anticipating higher profits by mid-2018, up from 45% and 41% in 4Q2017 and 1Q2017 respectively. The index for planned fixed investment also rose to its highest since 2Q2011. At 140, this suggests that an increase in capital expenditure is in the pipeline, with half of the CEOs disclosing such plans. Additional manpower is on the cards as well, as indicated by the expected employment index, which grew to 140, another high since 3Q2013. Forty-eight per cent of the CEOs plan to increase their headcount in the coming months, up from 45% last quarter and 38% a year ago. Findings of the 4Q2017 survey showed that organisations encountered the most difficulties in getting the right talent in the middle management category. Among them, according to the latest survey, Millennials/Generation Y (born 1977-1995) form the bulk of the CEOs’ middle-management workforce, ranging from 31% to more than 90%. Baby boomers (born 1946-1964) and Centennials/Generation Z (born 1996 and later) comprised the smallest proportion of middle managers. Only 1% to 10% of baby boomers and Centennials/Generation X are employed by 57% and 55% of the CEOs respectively. Most of those who constitute 11% to 30% of CEOs’ middle-management manpower are from Generation X (born 1965-1976). When asked how long CEOs think these middle-management staff will stay in their firms, almost three quarters of them believe that those from Generation Z/Centennials will remain for one to three years. Close to 89% and 73% are of the view that middle managers from Generation X and baby boomers will stay for more than three years respectively. To expand their businesses, almost 82% of the CEOs would source their funds through traditional bank financing (including leasing and hire purchase). Government grants, the next most popular source of funds, netted 25% votes, followed by equity crowd funding (almost 17% votes). P2P financing, bonds and local offshore bourses were also noted by 4% to 8% of the CEOs. Another 10% cited — among other sources of funds — shareholders’ fund, private equity, initial public offering, internal funding, group funding and venture capital. In the 4Q2017 survey, 49% of the respondents had adopted e-commerce in their businesses. The current survey shows that among those CEOs, most (68%) are selling through their own website while 29% and 19% are selling through Lazada and their own e-procurement platforms respectively. Sixteen per cent are selling through Alibaba, 4% through Zalora and 3% via Amazon. Among the other platforms used by 20% of the CEOs are 11 Street, Shopee, Facebook, B2B and YouTube. The Boston Consulting Group has identified nine pillars of technological advancement that underpin Industry 4.0. When asked about the status of adoption and awareness of each of these technologies currently in use, Cloud Computing and Cybersecurity are the most popular, with 47% and 32% of the CEOs using them to protect their information systems respectively. This is followed by 3D Simulation, which is used by 14% of the CEOs for product development and production processes. Thirteen per cent use Vertical and Horizontal System Integration to connect with other companies, suppliers, vendors and customers while almost 12% use Industrial Internet of Things, where machines are fitted with sensors and interconnected to collect and share data. Big data (advanced data analysis methods for predictive analytics, user behavior analytics, and so on) and Additive Manufacturing to build physical 3D objects through the layering of materials such as 3D printing are used by 11% and 7% of the CEOs respectively. Only 6% of the CEOs use Augmented Reality (using computer-generated virtual reality to give a live view of a real-world environment with sound, video, graphics, haptics or GPS data). Even lower was the use of Autonomous Robots to perform complex tasks, interact with one another, and work safely and learn with humans, with only about 5% using it. Although 68% of the CEOs do not use Autonomous Robots and another 68% do not use Additive Manufacturing currently, only 19% and 14% intend to do so later respectively. Most are planning to use big data (44% responses), Vertical and Horizontal System Integration (34%) and Cybersecurity (29%) sometime soon. Fourteen to 29 per cent of the CEOs intend to use the other technologies in future as well. Only 3% to 12% are not aware of these technologies and, among these, most (12%) are unaware of Vertical and Horizontal System Integration, followed by Additive Manufacturing (11%) and Augmented Reality (10%). Cloud Computing received the least responses (3%). Twenty per cent of the CEOs in the 4Q2017 survey indicated that they are currently using electric cars and 80% are prepared to use them. Of the advantages from a full conversion to using electric cars, a reduction in pollution was unanimously cited by almost 88% of the CEOs. Sixty-two per cent opined that it would be more economical, while low maintenance and higher safety factor were noted by 28% and 16% of the CEOs respectively. Section 67 of the GST Regulations 2014 stipulates that input tax credit refunds are to be paid within fourteen working days from the date of filing the GST returns online and 28 working days for manual submission. Results of this survey found that the average time taken by most companies for a refund is one to three months, with 44% of the CEOs confirming this. Only 9% received their refunds promptly, taking an average time of up to 14 working days, while 30% received theirs in less than a month. Seventeen per cent took an average of more than three months to get a tax refund. The main issue faced by respondents with their tax refunds was the requirement of additional documents, as claimed by a majority of almost 39% of the CEOs. Twenty-three per cent lamented on the lack of updates on their refunds, while 33% had to undergo a Customs desk review/audit and 9% faced difficulties contacting the Customs Department. A majority (20%) of the CEOs estimated their personal total current transactions that are cashless to be as much as 60%, while 17% and 16% assessed theirs at above 75% and up to 45% respectively. Only 6% did not partake in any such transaction personally. On a business level, most (42%) CEOs believed that their total cashless transactions are more than 75% currently, while 12% and 11% approximated theirs to be up to 15% and up to 75% respectively. Effective Jan 1, 2018, employers nationwide are required to pay the levy for foreign workers. Notwithstanding the higher cost of hiring now, more than half (52%) of the CEOs revealed that they will continue to hire these workers. During the tabling of Budget 2018, it was announced that the mandatory maternity leave for the private sector had been increased from 60 to 90 days. When asked if they had implemented this, three quarters of the CEOs revealed that they had yet to do so. According to the Ministry of International Trade and Industry, China continued to be Malaysia’s largest trading partner for the eighth consecutive year since 2009. With China being a dominant player, CEOs were asked if they were involved in any trade with China, to which almost 67% said they bought from China while 24% sold to China. Transactions of most (65%) of those who trade with China are denominated in the US dollar, while for 26% and 9% of the CEOs, trade with China are transacted in renmimbi and ringgit respectively. In the next six months, the top three investments of CEOs are equities (44%), fixed deposits/cash (41%) and local real estate (37%). Twenty-four per cent will likely invest in unit trusts/mutual funds, while 13% are interested in private equity. Eleven per cent are considering bitcoin/ethereum and bonds are the choice of 8% of the CEOs. Another 8% are eyeing foreign real estate, while gold and/or silver and private equity appealed to 7% of the CEOs this time around. 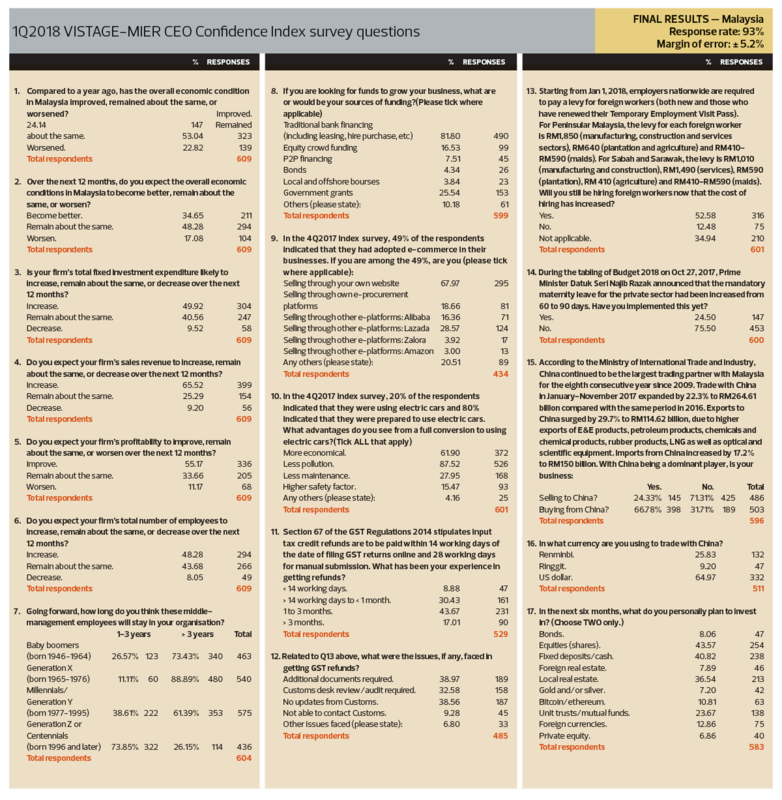 Since its inception in 2003, the CEO Confidence Index, a quarterly survey of Vistage members in Malaysia, has become a leading indicator of what leaders of small and mid-sized companies are thinking about and planning for the future. These insights provide a leading indicator for employment, capital expenditure, sales and revenue trends. Each quarter, Vistage International polls its membership in Malaysia, the US, Canada, the UK and Australia. In 4Q2005, Vistage Malaysia – a licensee of US-based Vistage International, the world’s leading chief executive leadership development organization – entered into a strategic alliance with the Malaysian Institute of Economic Research (MIER) to co-brand the CEO Confidence Index.